Whilst still preparing for his sixth year exams at Williamwood High School in Clarkston, Aidan broke into the Queen's Park first team in November 2012 after coming up through the youth system at Hampden Park, and scored on his debut in a 2-1 win over Stirling Albion. He scored the winner in his next game, a 3-2 win over Annan Athletic, and from then on he missed only two games for the rest of the season, making a total of 25 appearances and scored 6 goal in his first senior season, whilst still only 17 years old. 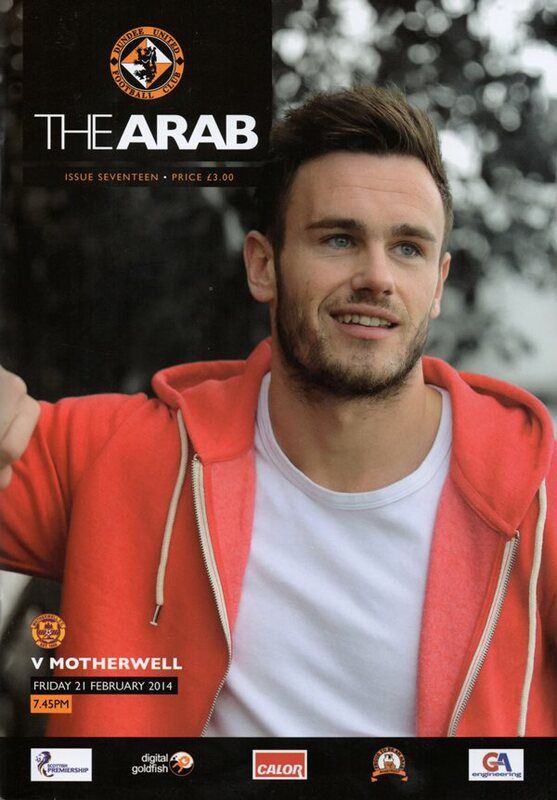 Gaining attention from several clubs North and South of the border, Aidan decided to join the club where his father, Paddy Connolly, had started his own career back in the 1980s, and along with fellow Spiders player Andrew Robertson, he signed a two year deal at Tannadice in June 2013. 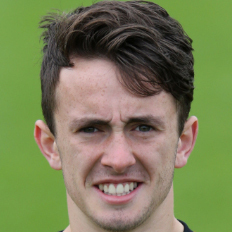 In between spells with the United Under-20s, Aidan enjoyed a spell on loan at Brechin City until the end of January 2014. Following his loan spell, he made his first team debut as a substitute against Motherwell in February. Three games into the new season, Aidan agreed a contract extension to keep him at the Club until the summer of 2016. 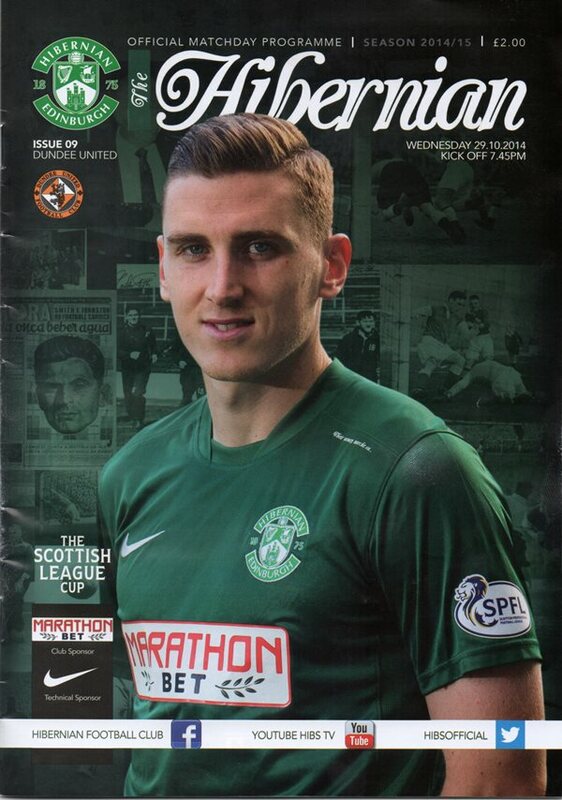 He scored his first professional goal as he made his full debut in the exciting 3-3 League Cup tie against Hibs at Easter Road, and followed that up with a second goal a month later against Kilmarnock at Tannadice. By the turn of the year Aidan was a regular in the first team squad, and as the season went on he was used effectively both in the starting eleven and from the bench. In March, he collected a runners-up medal as an unused substitute in the League Cup Final against Celtic. 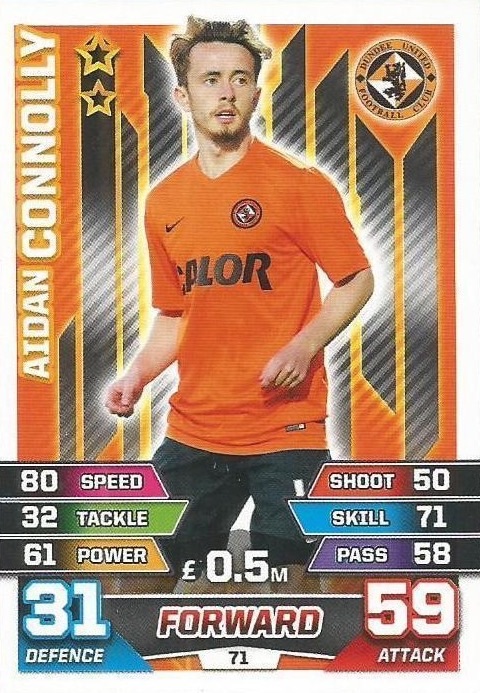 Failing to make an impression throughout the remainder of the year, or under new manager Mixu Paatelainen, Aidan's contracted was terminated by mutual consent in January 2016. Aidan was born on this date in Dundee. Jackie McNamara made two changes to the line up which came from behind to win 3-2 against Kilmarnock. John Souttar and Ryan Gauld missed out through injury with Gavin Gunning coming in at the centre of defence. Ryan Dow also gained a starting berth after impressing as a substitute the last time out. Manager Jackie McNamara brought some freshness to the team that were defeated in Inverness at the weekend, most notable was the inclusion of youngster Aiden Connolly. The home side made 5 changes from the team that played well but lost at Motherwell prior to the international break. Souttar, Rankin, Dow, Spittal and Connolly all dropped out and Dillon, Telfer, Mackay-Steven and Ciftci were drafted in. It was the hosts who got off to the perfect start when four minutes in Kris Boyd latched onto a pinpoint Josh Magennis cross and guided it into the back of the net. Just eight minutes later Kilmarnock were inches away from doubling their lead, a defensive mix-up seeing the ball fall invitingly for Tope Obadeyi at the back post, however, the attacker was unable to gather any real connection from his shot and Michal Szromnik pounced to clear the ball to safety. Goalscorer Boyd, who has proved a thorn in the United’s defence throughout the striker’s career, almost added another, but the striker could only scuff an effort wide of the target after Magennis had once again set him up. Just five minutes before the half hour mark however, United were back on level terms, Billy Mckay coolly sending Jamie MacDonald the wrong way from the penalty spot after Stuart Findlay was shown a straight red for a late challenge on Ryan McGowan after a goal-mouth scramble inside the box. United thereafter did manage to get a real foothold of the game, and Billy Mckay could have put Paatelainen’s side in the lead had his one-on-one effort with Jamie MacDonald not been saved from close range.